Lara is donating all of the proceeds from the book to various charities focused on supporting marginalized people in tech, including Girl Develop It, Women Who Code, Black Girls Code, #YesWeCode, Latinas in STEM, Hack the Hood, and DonorsChoose projects like Growing "Girls with Gadgets"! and Girls Can Code, Too!. So if you enjoy the book, please consider buying it! Lara Callender Hogan is the Senior Engineering Manager of the Performance team at Etsy. Lara previously managed Etsy’s Mobile Web Engineering team. Before joining Etsy, Lara was a User Experience Manager and self-taught frontend developer at a number of startups. She’s been certified as an EMT, owned her own photography business, and co-founded an LGBT wedding website. She also believes it’s important to celebrate career achievements with donuts. 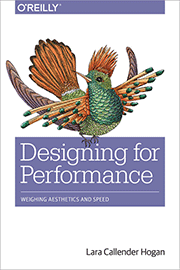 The animal on the cover of Designing for Performance is a tufted coquette (Lophornis ornatus), a tiny hummingbird that breeds in eastern Venezuela, Trinidad, Guiana, and northern Brazil. Also known as the splendid coquette, this hummingbird is so tiny that it can easily be confused with a large bee as it moves from flower to flower. Its red beak has a black tip and is short and straight. The female doesn’t have very flashy plumage, but the male has striking blackspotted and orange-colored feathers that project from the sides of his neck and an orange head crest. Hummingbirds in general are quite solitary, so the tufted coquette is mostly found alone or in small groups, as it searches for nectar and small insects to feed on. The cover image is from Wood’s Natural History. The cover fonts are URW Typewriter and Guardian Sans.